Strapping my iPad into a faux arcade cabinet is the last thing I want to do with my tablet. Oh, I can get behind PAC-MAN and Space Invader ports, for sure, but the device has become much more than a toy for me over the last year — it’s become a browser, an e-reader, and a respectable game machine capable of offering some compelling modern experiences. But for those of you who do actually want to relive those coin-op days, know this: Ion and Atari are teaming up to put out the “iCade,” an arcade cabinet for the iPad this Spring ($99). The cabinet, as you can see from the following Engadget video from CES, features a full-sized joystick and eight arcade-style buttons. The apparatus itself is gleefully decorated in a retro style, though it’s missing the scratches and smoke damage that we’ve started to associate arcade cabinets with. According to Ion, the iCade “ensures safe loading and unloading of your iPad,” as well as a secure fit. It also positions the iPad at a decent viewing angle for arcade play. The stick and buttons, by the way, will operate via Bluetooth. The kicker here is that Ion’s business partner, Atari, will be publishing “a huge suite” of classic games to market with the device. In the press release, the only game name-dropped is Asteroids, but I’d imagine that we’ll also see ports of Centipede, Tempest, Missile Command, Crystal Castles, Super Breakout, and Gravitar at the very least. Curiously enough, some of these games have already been released by Atari, but were pulled early last year. We’ll have to wait and see how different these re-released games turn out being. 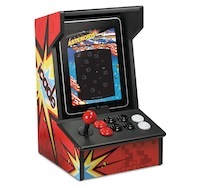 OK, so maybe I do kinda want to strap my iPad into an arcade machine. Anyone with me?